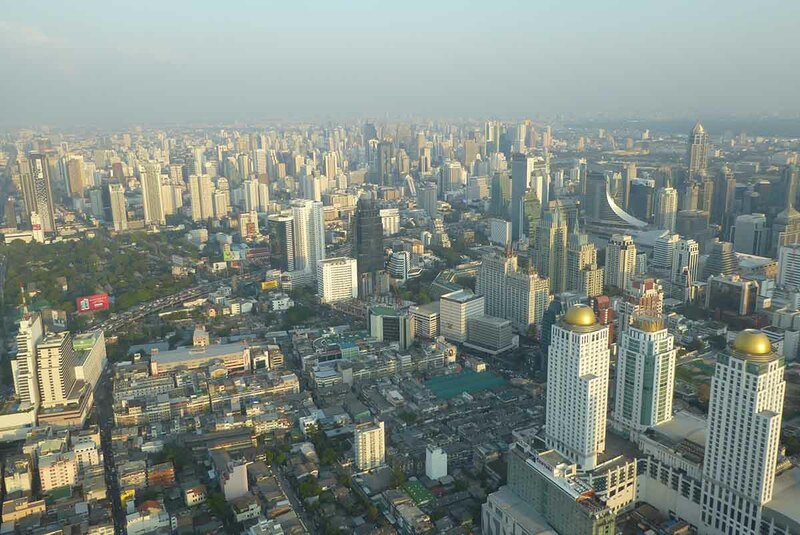 The Baiyoke Tower is the tallest hotel and second tallest skyscraper in Bangkok after the new Mahanakon building. It is the tallest hotel in South East Asia and the seventh tallest hotel in the world. Completed in 1999, it is 304 meters high with 85 floors. 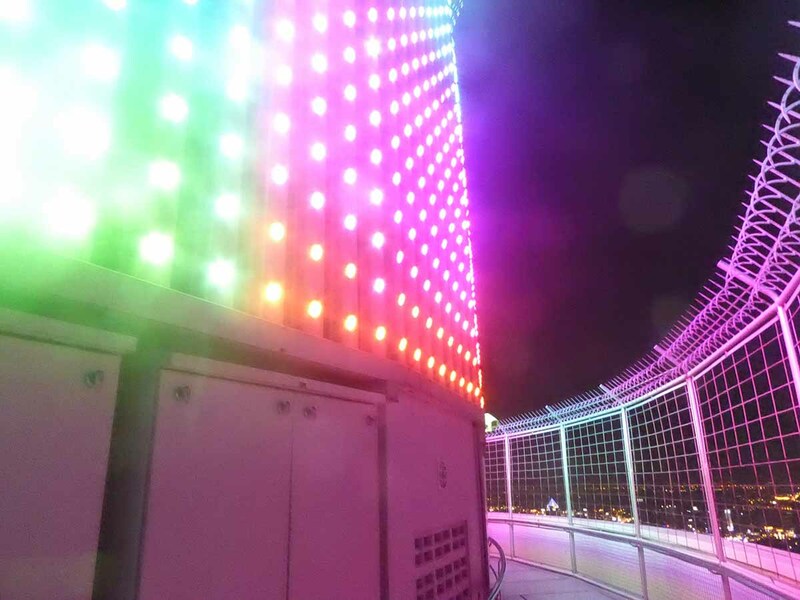 The 84th floor has a 360-degree revolving outside observation deck while the 77th floor has a glass-enclosed skywalk which gives stunning views of the city. 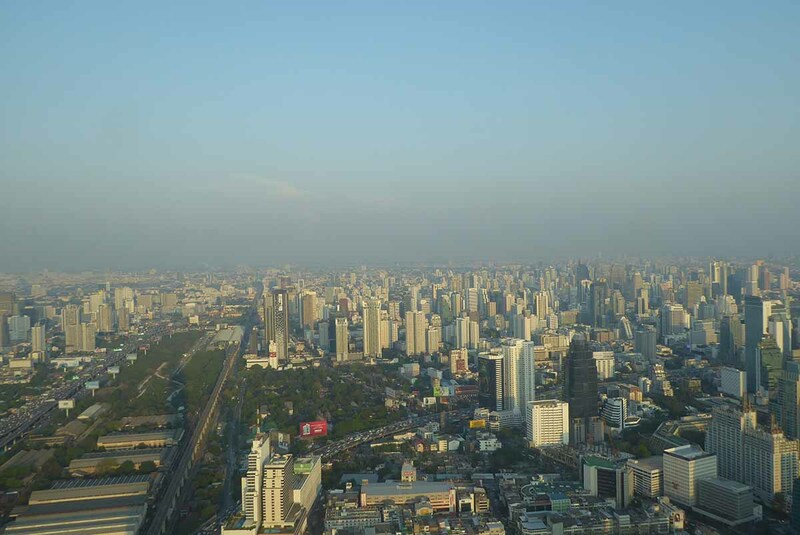 On a clear day, you can see the Victory Monument to the north and the Chao Phraya river to the south and west. There are maps, computerized multimedia kiosks, and coin activated telescopes to help you find city landmarks. 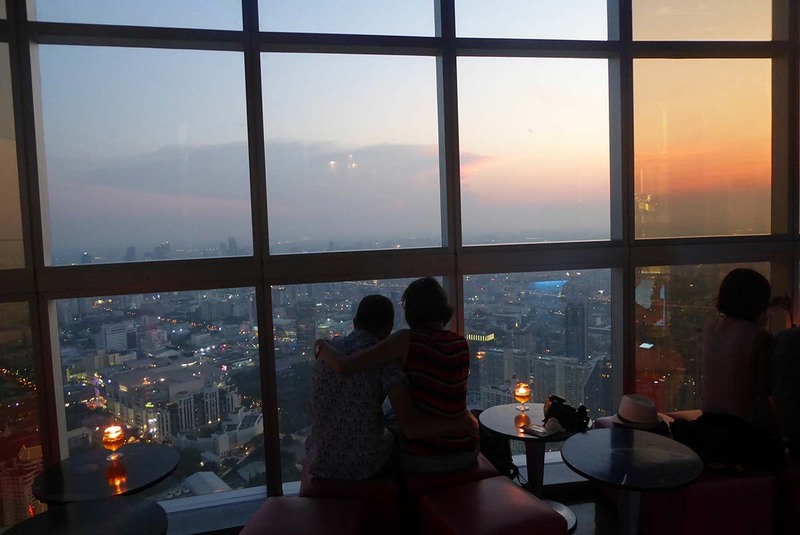 The 83rd floor has a Rooftop bar, the highest bar in Bangkok. 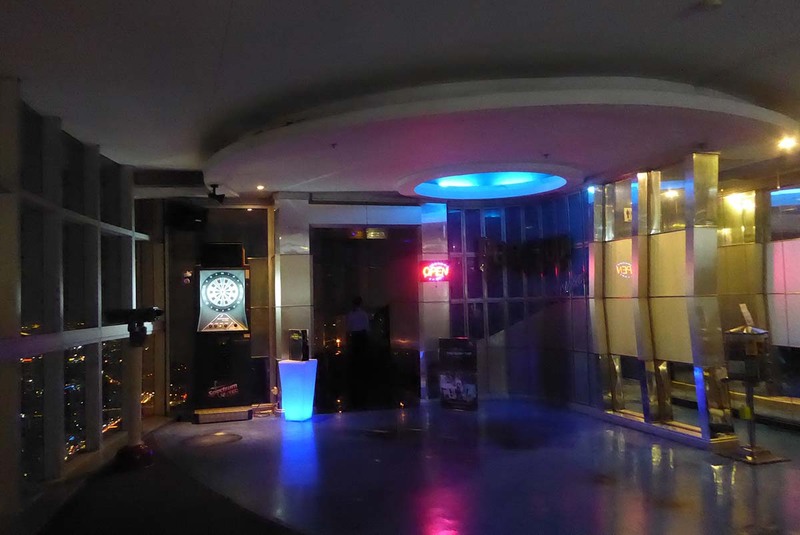 It is open from 17.00-02.00 daily and features live music. 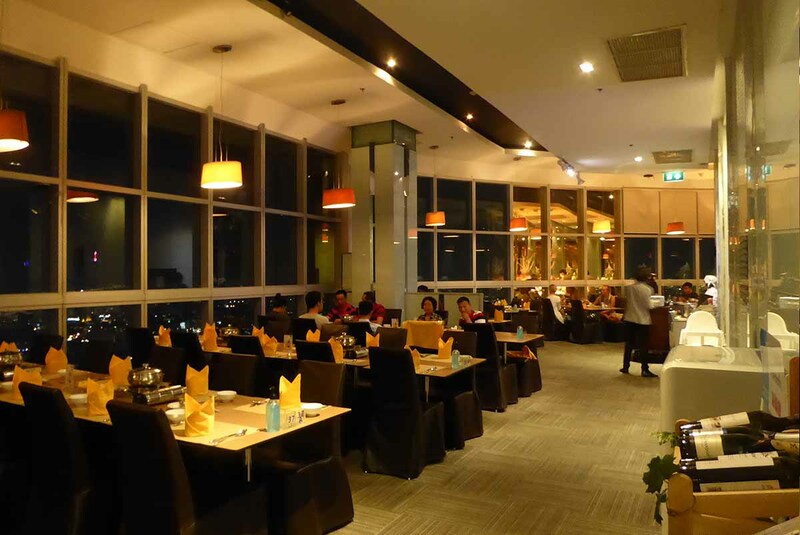 The building has a choice of Thai, International, and Seafood buffet style restaurants on floors 75, 76, 78, 79, 81, and 82. Prices for the evening buffets range from 1100 baht to 1760 baht per person. 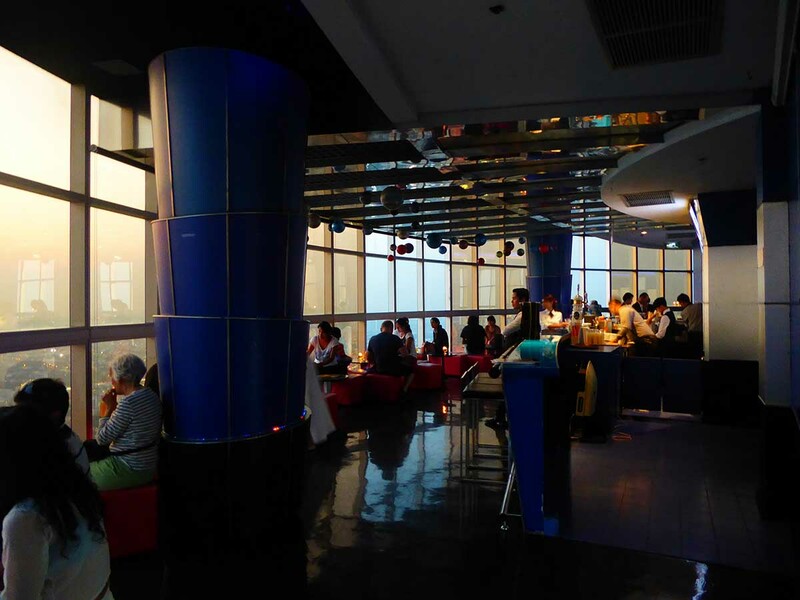 A Lunch buffet is only available at the Bangkok Sky restaurant on the 76th & 78th floors. between 11.00-14.00 for 940 baht. 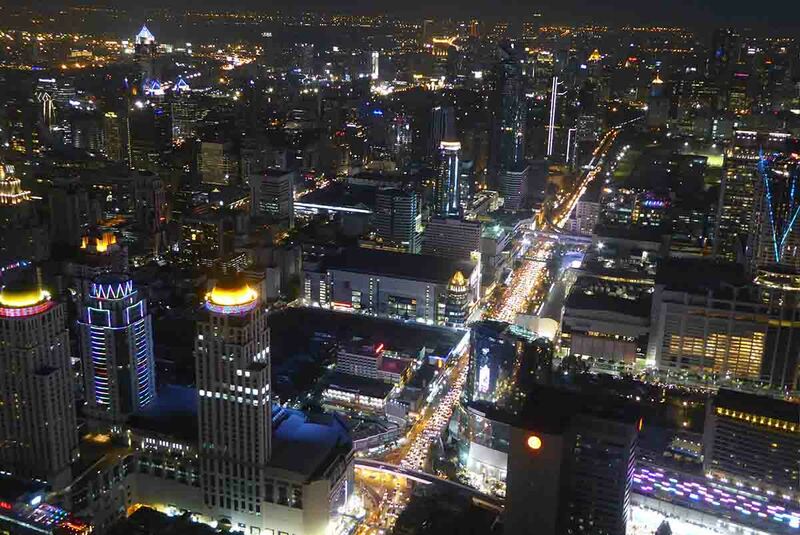 The Bangkok Balcony on the 81st floor has a 20-seat open-air dining terrace. The Baiyoke Floating Market on the 75th floor is in the style of a floating market with a buffet of over 100 Thai dishes displayed on boats. There is also a fruit buffet on the 18th floor between 09.00-21.00 for 700 baht. All the restaurants are open in the evening from 17.30 until 23.00 and include access to the observation decks. Restaurant reservations can be made online in advance or at the hotel. 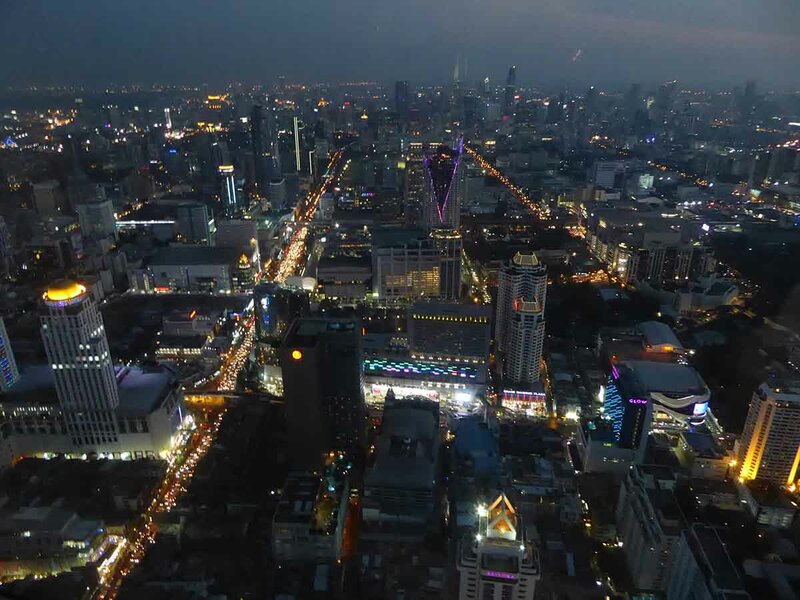 Non-dining tickets for the observation decks are 400 baht which includes a free drink at the Rooftop bar on the 83rd floor. The hotel rooms are on floors below the 76th. There is a four-floor market at the base of the hotel. The basement Underground Market specializes in alternative clothing and accessories with a good choice of Retro, Punk, Grunge and Rockabilly items. This is where to look for a Sid Vicious or Kurt Cobain T-shirt. The upper three floors have the usual Pratunam choice of more mainstream cheap clothing along with souvenir shops. 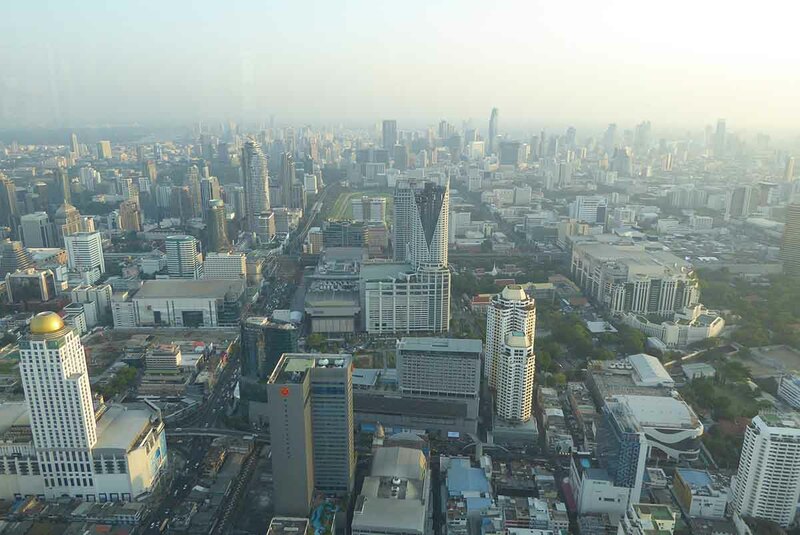 Want to stay at the tallest hotel in Bangkok? Book discounted rooms here. Location: 222 Ratchprarop Road, Soi 3, Pratunam. 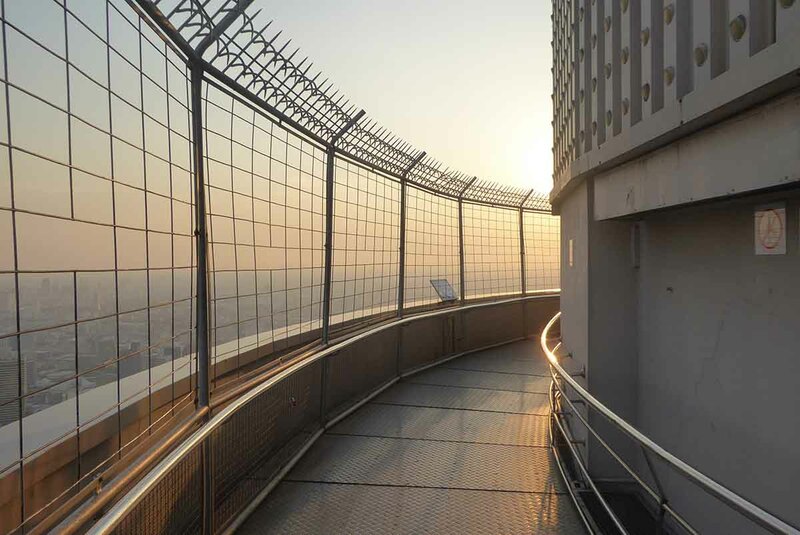 Admission: 400 baht for observation decks with a free drink. Free admission with restaurant booking. How to get there: BTS, Airport Rail Link, Bus. BTS: Phaya Thai Station (exit 4). Turn right on to Sri Ayutthaya Road, walk straight ahead, turn right on to Ratchaprarop Road, then right into Soi 3, and the Baiyoke Tower is straight ahead on your right. 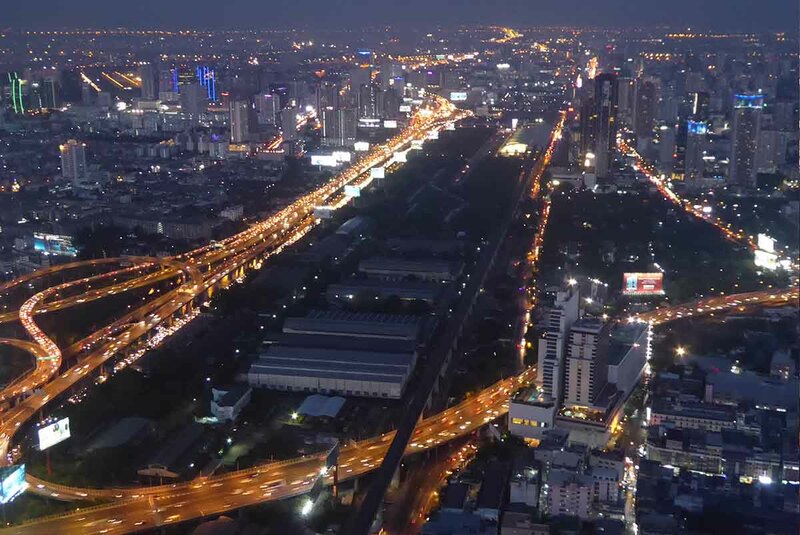 ARL: Ratchaprarop Station (Ratchaprarop Road exit), turn right on to Ratchaprarop Road, then right into Soi 3, and the Baiyoke Tower is straight ahead on your right.